It is a well-known fact that London is an expensive city to live in, but what is lesser known is that the rents in the capital are increasing faster than anywhere else in the country. In London, the average age of a first time buyer is now 38 years old, which is higher than the national average. In Westminster there is a chronic housing problem, caused by a lack of affordable housing. This has led to 30% of housing in Westminster being overcrowded, as defined by the government. This is the third highest rate of overcrowding in the country and is significantly higher than the London and England averages of 17% and 7% respectively. In 2011 the average cost of renting a 3-bedroom property in Westminster was £700 per week, while the Housing Benefit for a 3 Bedroom property was capped at £340, meaning those without alternative sources of income or financial aid cannot sustain regular affordable rent payments. The number of families accepted as “homeless” by Westminster council has increased by 86% between 2010/11 and 2012/13. Even so, only half of applications made were accepted in 2012/13. This is put down partially to applications that do not provide enough supporting evidence, demonstrating that applicants need help with applying. Our befrienders offer services to alleviate stress that a family may be experiencing in terms of housing, alongside offering support with filling in housing benefit applications which is especially useful for those whose first language is not English. 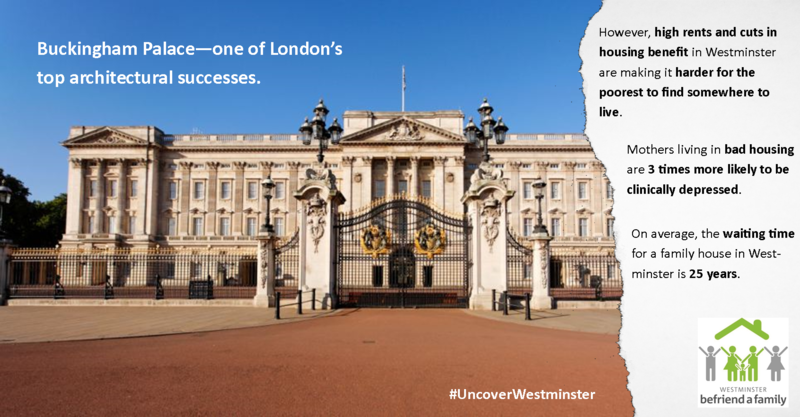 Although the London housing crisis is not unknown, the severity of it is often underplayed so we need to #UncoverWestminster to raise awareness of the struggles that poverty presents in terms of housing and continue to build affordable homes throughout London so that every adult, child and family has somewhere that they can call ‘home’.